Cummings Veterinary Medicine | Is There an App for That? Veterinary students carry a few essentials through jam-packed days of lectures and clinical rotations: bottled water, laptops, cell phones, snacks, stethoscopes. For students in the three-week radiology rotation, Tufts-supplied iPads are on the list. Radiology faculty members Dominique Penninck, Olivier Taeymans, James Sutherland-Smith and Ryan King were awarded $20,000 from the Tufts Innovates teaching grant program to develop and distribute video-based teaching tools for diagnostic imaging. 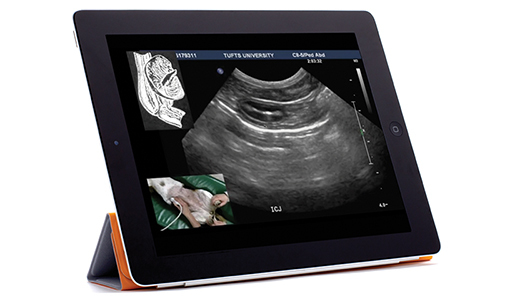 The iPad computers loaned to students during the rotation come loaded with 11 faculty-created videos that demonstrate how to perform an abdominal ultrasound on a dog, as well as how to recognize the kidney, bladder, liver, gallbladder spleen, adrenals and gastrointestinal tract. The tablet computers also come populated with images from more than 100 radiographic teaching cases that are reviewed during the rotation. The technology should help ease students’ transition from classroom to clinic, says Sutherland-Smith. When students arrived in the teaching hospitals for their clinical rotations during the third and fourth years of the training, the radiology team found they were reteaching much of the introductory material from early on in the veterinary curriculum. “We would lecture and assume it was retained,” he says. The videos won’t replace hands-on training, says Sutherland-Smith. Being able to review the video tutorials on their own schedule means that students will have more time to focus on learning from active cases. The iPads also offer 24/7 access to case materials, many of which radiology students previously could get only by logging into multiple software programs at the Foster Hospital for Small Animals. “The feedback we received from the students is that they’ll likely benefit from looking at more of these cases because it’s so much easier to do so,” says Sutherland-Smith. José Garcia-López, a large animal surgeon, also believes that technology can help transform teaching. Earlier this year he began using an iPad to lead classroom discussions on evaluating lameness in horses. “Normally, when I am teaching the basics of lameness, I’ll see students nodding their heads through the lecture, whether they understand or not,” he says. That said, Sutherland-Smith and Garcia-López agree that figuring out how to best use technology in the classroom would benefit from some research. “We try to make evidence-based decisions whenever we can in medicine. We need to do that for educational methods as well,” notes Sunderland-Smith. To begin to gather some data, Sutherland-Smith is working with Donna Qualters, director of Tufts’ Center for the Enhancement of Learning and Teaching, to develop a survey to gauge veterinary students’ impressions of the technology’s value and compare that information with their performance on the radiology exam given at the end of the rotation.